Size of this preview: 416 × 600 pixels. Other resolutions: 166 × 240 pixels | 518 × 747 pixels. 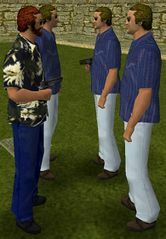 Members of the Vercetti Gang in Grand Theft Auto: Vice City.